The Magic Castle is a private club and the home of the Academy of Magic Arts, created by brothers Milt Larsen and Bill Larsen Jr. The place opened in 1963 in an old Victorian mansion in Hollywood, California. As a young man in law school, I was a professional magician who would often appear in their close-up room in the early 1970s. I was introduced to the place by Dai Vernon, the world's greatest magic mentor, who became a friend and ultimately a client. Bill Larsen passed away in 1993, but brother Milt is still with us, as is Bill's widow, Irene. Bill's daughter, Erika, is now the President of the Academy of Magic Arts. The Larsen's are the first family of magic, preserving both the art and promoting the artists. Irene resides in a Spanish-style estate in the Hancock Park area of Los Angeles, with a magical history of its own. In 1929 it was the home of magic manufacturer Floyd Thayer. He named it "Brookledge," a tribute to a brook that runs through the property. In 1933 he built a showroom, workshop, and theatre adjacent to his home to showcase his high quality props, and it became the Thayer Magic Studio. It was transformed into a private gathering place for the finest magicians from all over the world. They would often stage shows in the theater, demonstrating their latest and greatest effects to their peers. It was the business and social hub for magic in 1930's Los Angeles. 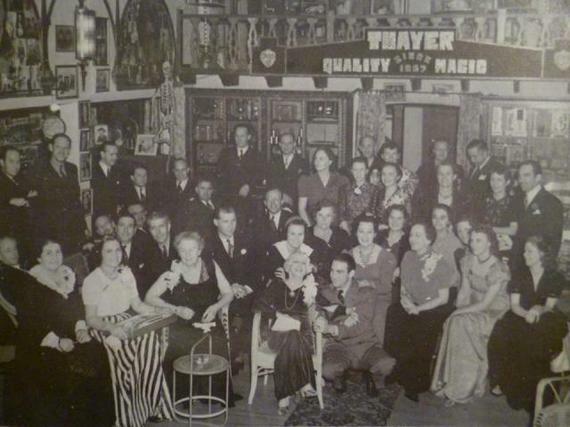 1930s Thayer Magic Studio gathering of magicians; Houdini's widow, Bess, in front and center. In 1942, Thayer hung up his top hat and sold the property and his business to the Larsen family. Like this author, William Larsen, Sr. was an attorney as well as a professional magician. His sons, Bill and Milt, grew up in Brookledge, and the place continued to be a meeting place for conjurors and prestidigitators-- ultimately inspiring the Larsen brothers to create The Magic Castle®, a venue envisioned by their father. Brookledge stayed in the family, and became the home of Bill and Irene Larsen and their children. Daughter Erika grew up there, and in 2009 she came up with the idea to return the property to what it once was. She opened the theatre, studio, and outdoor areas as a private venue for friends and guests for invitation-only variety arts performances which have become known as "The Brookledge Follies." It is indeed a magical place, with the restored theatre, an exotic secret garden and that wonderful bridge-covered brook running through the property. But the real magic transcends the location and is attributable to the charm, humor, and grace of 79 year old Irene and of her daughter, Erika, who produces these shows, bringing a unique brand of vaudeville-inspired talent to Brookledge every month. Erika's daughter Liberty, is a frequent performer in the Follies and is following in the same family tradition. Last night I was once again their guest for a moon lit garden reception and show, followed by an after-party, all with an eclectic group of attendees-- an odd ball mix of magicians, performers, celebs, and a wide array of other interesting invitees. This particular show featured magician Michael Cabonaro, marionettist Matt Scott, vocalist Ursula Knudson, and ventriloquist Jay Johnson, with music directed by house musician Kristian Hoffman. Carbonaro performed a spooky Spirit Cabinet effect, his variation of something that's been a classic since the mid-1800s. Carbonaro was often seen as "The Magic Clerk" on The Tonight Show with Jay Leno and is the host of the cable show The Carbonaro Effect. It was a pleasure to see some of his presentations. My friend Jay Johnson is one of the finest ventriloquists in the business. He did a 20 minute closing set with his singing vulture puppet that delighted the audience. 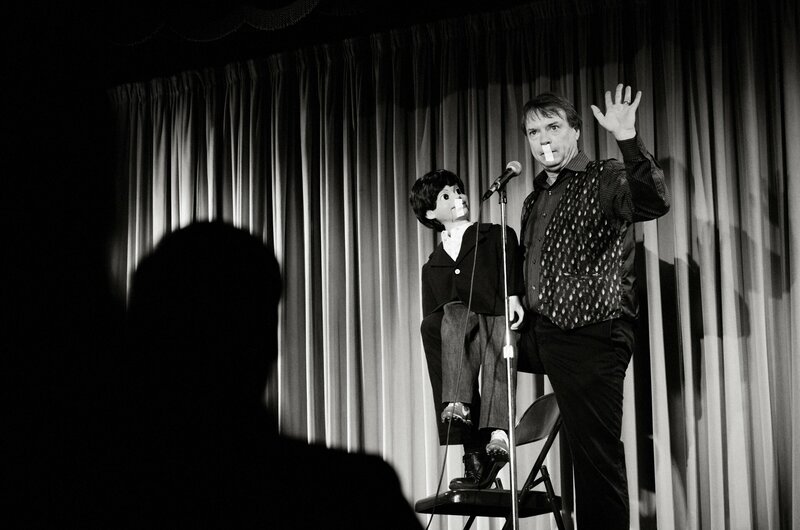 Jay won a well-deserved Tony Award© in 2007 for his Broadway Show, "Jay Johnson, the Two and Only," a production that transcends ventriloquism to be a touching and entertaining theatrical experience. Jay is also known for his work as the character "Chuck" on the television series "Soap," where he was always accompanied by his alter ego, a puppet named "Bob." Bob also sometimes appears at Brookledge. Master ventriloquist Jay Johnson with Bob at Brookledge, both working with their mouths taped shut. On other occasions, I have seen a wide variety of avant-garde performers, such as frequent host magician Rob Zabrecky, Prince Poppycock, Puddles Pity Party, as well as sword swallowers, burlesque queens, dancers, fire eaters, contortionists, comics, and even a guy who put himself inside a giant balloon. Often brilliant, sometimes bizarre, the venue is more Felliniesque than Shakespearean. "A place you can hardly believe exists. A fairy tale come to life. Not only is it a historical landmark, it is simply magical." -- Paul Reubens (aka: Pee-wee Herman).